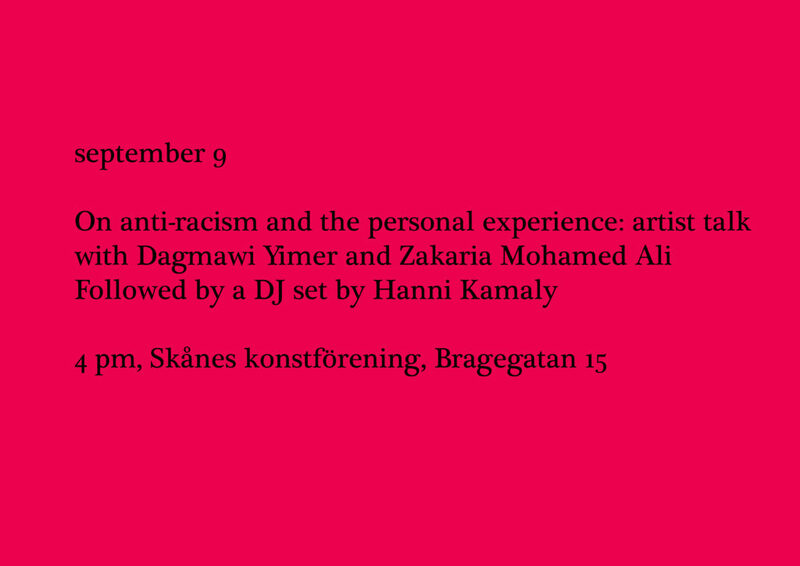 On anti-racism and the personal experience: artist talk with Dagmawi Yimer and Zakaria Mohamed Ali. We welcome you to the artist talk given by two of the film makers featured in the exhibition No Country Like. Their work and film practice is strongly interconnected with their personal experience of migration in the Italian context. Through their films, collection of stories, and anti-racism workshops, they continue to fight for the rights of migrants. It is not by chance that this event is held on September 9, possibly one of the most important election days in the recent history of Sweden and so decisive of its future. We invite you to come and engage in the conversation following the artist presentations and then stay for a moment of catharsis through Hanni Kamaly DJ’s set. Dagmawi Yimer was born and grew up in Addis Ababa. He left his country after the 2005 post-election unrest in which hundreds of young people were killed and put in jail. After a long journey across the Libyan desert and the Mediterranean, he came ashore on the island of Lampedusa on 30 July 2006. In Rome, after having participated in a video-making workshop in 2007, he co-authored the film “Il deserto e il mare” (The desert and the sea) along with 5 other migrants. Subsequently he was co-director to the 2008 documentary film “Come un uomo sulla terra” (Like a man on earth). He shot the documentary “C.A.R.A. ITALIA” (Dear Italy) in 2009 and “Soltanto il mare” (Nothing but the sea) in 2011, along with several other short films. In 2011 he coordinated the collective film project “Benvenuti in Italia” (Welcome to Italy), 2015 “Asmat-Names”, and in 2016 he was assistant director for the feature film “The Order of things’’. He has produced short documentaries for the Italian national tv and works with various universities, schools and institutions, as a docent on immigration and cinema. Currently he is involved in giving small workshops on documentaries to new migrants/refugees. Zakaria Mohamed Ali: I was born in 1986 in Mogadishu and have worked as a freelancer in Somalia during the civil war. I risked my life several times for my work, and in Mogadishu I lost my friends and colleagues. I left my country on December 2, 2007 and went to Hargeisa, in Somaliland – from there begins my escape, the journey to search for a better future (looking for sense). I have arrived in Italy via Lampedusa in August 2008. In 2011 I participated in the video-training project promoted by Archivio delle Memorie Migranti (AMM) and I realized one of the episodes of the film “Benvenuti in Italia – Welcome to Italy”: “Dadir”. In 2012 I made the short documentary “To whom it may concern”, which narrates my return to Lampedusa, by reading my diary. It was an opportunity for me to recall the stay in the CIE and go in search of lost memories.The documentary was selected by the “House of European History Exhibit” of the European Parliament in Brussels. I have also directed other documentaries, such as “L’attesa” (2012) or “Il signore di Mogadiscio” (The man from Mogadishu) (2013-2018, work in progress), which gives voice to the survivors of the shipwreck of 3 October 2013, many still detained in the CIE after the tragedy that killed 368 migrants from the Horn of Africa. In Rome I work with AMM, collecting and disseminating life stories and testimonies on migration, both oral and written. AMM also produces audio and video documentaries and organizes personal narrative and antiracism workshops for schools with the active participation of migrants. Hanni Kamaly’s bio coming up soon. The event will be held in English and it is part of the project No Country Like.